Of course I want to understand who I’m selling to; otherwise how would I know how to sell to them? But when marketing B2B products and services, strategists sometimes ask irrelevant, even pointless, buyer persona questions, while ignoring hidden issues that actually have more of an impact. Where did the prospective business buyer go to college? Hm, I don’t care. How many kids do they have? Don’t care. How old are they, what’s their income, where do they live, what’s been their career path, what publications do they read, what are their hobbies, and what’s their typical day like? Yes, there are exceptions, but overall, I don’t care, I don’t care, and I don’t care. Sure, I want to know the person’s role and responsibilities within their company. But peripheral details can clutter the picture, making harder to zero in on messaging that will create a genuine connection. The buyer persona questions I prefer to ask have more to do with the person’s inner world than their outer world. For example, factors like the job title of the person they report to may not be as important as the worker’s perceptions of their boss’s expectations. 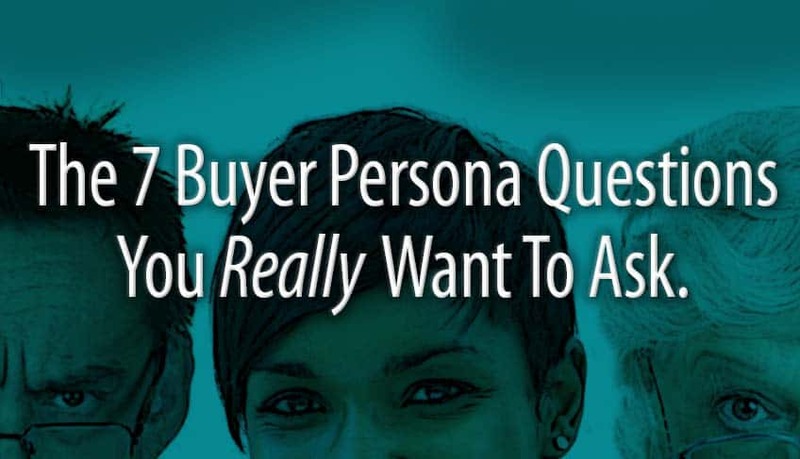 So beyond the typical Discovery queries related to the product, its purchase, and its benefits to the customer, here are the kinds of business buyer persona questions I generally like to pursue. 1 What would make the target customer feel good about themselves? Maybe they want to be seen as a knowledgeable expert by their co-workers. Maybe they want to convince their boss that this is a wise purchase to get their buy-in and personal approval. Maybe they want to show they can save the company money. Note that this last one is related to, but not the same as, actually saving the company money. Good copy not only focuses on product benefits, but also gives the prospective buyer the ammunition to convince superiors and peers that their recommendation (your product) is the smartest possible option. 2 What would make the target customer feel bad about themselves? Being seen as making the wrong choice, incapable of solving the problem, wasting money, or maybe something more specific to the circumstance. Marketing appeals that focus solely on logical product benefits are more likely to work on robots than on real humans. Everyone from the CEO on down is highly aware of how they’re seen by others, and that, subconsciously or not, affects their decisions. The bigger the company, the more complex the dynamics can be. Good writing employs a subtle but suggestive touch in weaving those personal issues into a web page that’s ostensibly about the product. 3 How does the buyer see their options? This query might replace the standard marketing question of “who is our competition?” Look at this from the buyer’s point-of-view, and you’ll see that it’s not just about your direct competitors. Other perceived options could include performing the service in-house instead of hiring a vendor. It could be approaching the situation from an entirely different angle. It could be … doing nothing at all. What ramifications do these options have not just for that company, but personally, for your targeted prospect? 4 What obstacles might your buyer expect to deal with when pitching your product internally? If you’ve ever worked at a company with at least a dozen employees, you know that different stakeholders have different agendas. Some might be valid, but in the muck of office politics, what’s best for the company may or may not be the only driving force. There may not be a lot you can do about this as an outsider, but once again make sure your prospect, for example, can make a case for your product that is strong enough, for example, to overcome price objections from the bean counter department. A standard Discovery questions might be, who else has influence in, or might be affected by, this purchase decision? Let’s go further and ask how your target feels about those related considerations. 5 What bad experiences may they have had with providers like you in the past? Unless this is their first job, people’s business decisions aren’t made in a vacuum. In fact, the value of experience is knowing which mistakes not to make again. Remember that low bidder with all those unexpected add-on charges? Digging into this particular buyer persona question can guide you to emphasize certain strengths that counter the weaknesses of their last vendor. Nobody likes to be fooled twice. 6 What nagging questions are rolling around in their minds? Those questions aren’t always voiced, at least not at first, but if your web copy can predict and answer them to the person’s satisfaction (or at least suggest that you’re capable of answering them), that just might help your target breathe a bit easier. They might be wondering if you’re going to be around down the line to support your product. Or whether you’ll personally support them if they end up crossing swords with their I.T. department. No, you can’t anticipate everything. But with lots of experience putting yourself in the buyer’s shoes, you can anticipate the most important questions. 7 In their mind, what is the perfect happy ending here? Before making a purchase, we all mentally project a future in which we’ve bought and begun using the product or service. Why? As a kind of imaginary dry run to see if we’re making a good choice or perhaps overlooking some important detail. Take that mental journey with your buyer, and use it to paint a picture in which their highest hopes are attained, and their co-workers are regarding them with admiration, if not envy. Remember, every sell is an emotional sell, even in the B2B world. Point to the possibilities, but of course don’t promise outcomes that are unlikely. Asking ‘internal’ buyer persona questions will give you a deeper understanding of relevant issues that might affect the sale – from the customer’s own perspective. One list of buyer persona questions I came across recently included the query, does this person have pets? Well, unless they consult with their yellow lab about their workplace business decisions … who cares? Remember that developing buyer personas is just one part of the Discovery process. Learn some other tips for gathering the key info you need in Brilliant Websites Start With Smart Discovery Interviews.